Bacillus velezensis is an endospore-forming, free-living soil bacterium with potential as a biopesticide against a broad spectrum of microbial pathogens of plants. Its potential for commercial development is enhanced by rapid replication and resistance to adverse environmental conditions, typical of Bacillus species. However, the use of beneficial microbes against phytopathogens has not gained dominance due to limitations that may be overcome with new biopesticidal strains and/or new biological knowledge. Here, we isolated B. velezensis strain 9D-6 and showed that it inhibits the in vitro growth of prokaryotic and eukaryotic pathogens, including the bacteria Bacillus cereus , Clavibacter michiganensis, Pantoea agglomerans, Ralstonia solanacearum, Xanthomonas campestris, and Xanthomonas euvesicatoria; and the fungi Alternaria solani, Cochliobolus carbonum, Fusarium oxysporum, Fusarium solani, Gibberella pulicaris, Gibberella zeae, Monilinia fructicola, Pyrenochaeta terrestris and Rhizoctonia solani. 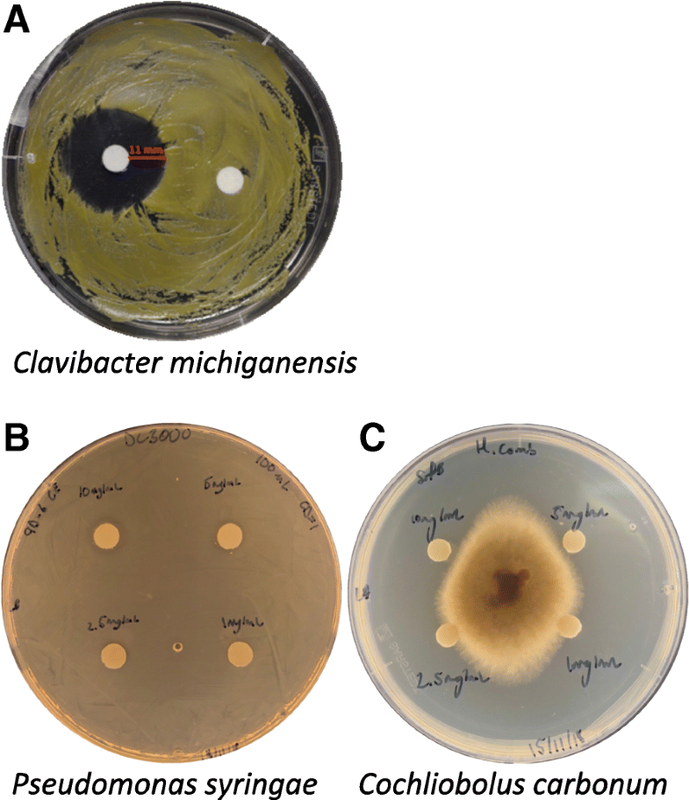 Antimicrobial compounds with activity against Clavibacter michiganensis were isolated from B. velezensis 9D-6 and characterized by high resolution LC-MS/MS, yielding formulae of C52H91N7O13 and C53H93N7O13, which correspond to [Leu7] surfactins C14 and C15 (also called surfactin B and surfactin C), respectively. We further sequenced the B. velezensis 9D-6 genome which consists of a single circular chromosome and revealed 13 gene clusters expected to participate in antimicrobial metabolite production, including surfactin and two metabolites that have not typically been found in this species - ladderane and lantipeptide. Despite being unable to inhibit the growth of Pseudomonas syringae DC3000 in an in vitro plate assay, B. velezensis 9D-6 significantly reduced root colonization by DC3000, suggesting that 9D-6 uses methods other than antimicrobials to control phytopathogens in the environment. Finally, using in silico DNA-DNA hybridization (isDDH), we confirm previous findings that many strains currently classified as B. amyloliquefaciens are actually B. velezensis. The data presented here suggest B. velezensis 9D-6 as a candidate plant growth promoting bacterium (PGPB) and biopesticide, which uses a unique complement of antimicrobials, as well as other mechanisms, to protect plants against phytopathogens. Our results may contribute to future utilization of this strain, and will contribute to a knowledge base that will help to advance the field of microbial biocontrol. Pathogens of plants are a major constraint to global food production, both in the field and as post-harvest diseases. While synthetic pesticides, including bactericides and fungicides, can be effective, the reliance on synthetic inputs in modern agriculture can cause serious environmental problems by affecting soil fertility, the development of insect resistance, and bioaccumulation of toxic residues in wildlife, livestock, and humans . Such concerns have prompted research into alternative, sustainable strategies to manage plant pests and diseases. The millions of microbes that live in soil represent a rich source of biodiversity with great potential for the development of biopesticides. Since biopesticides are derived from natural microorganisms, they are often less toxic and affect fewer non-target organisms compared with synthetic pesticides. In addition, they can be effective in small quantities and are biodegradable, largely avoiding pollution problems. Biopesticides are promising in promoting agricultural sustainability and intensification, helping to meet today’s complex challenges. Numerous microorganisms have been successfully developed into biopesticides at the commercial level, most notably strains of Bacillus thuringiensis (Bt) against certain types of insects. However, the use of beneficial microbes has not gained dominance or popularity for control of microbial pathogens, which may partially be due to the inconsistent responses among plant cultivars and field sites . These limitations may be overcome by developing new biopesticidal strains and further research into the biology of plant-microbe and microbe-microbe interactions. Many of the bacterial antagonists to microbial phytopathogens also belong to the genus Bacillus , and the use and number of antagonistically important Bacillus species is increasing very rapidly. Bacillus species synthesize various types of lipopeptide secondary metabolites with specific activities against plant pathogens, including many potent amphiphilic and surfactant lipopeptides comprising bacillomycins, iturins, surfactins, and mycosubtilin . In addition to their broad spectrum of biocontrol ability, Bacillus species replicate rapidly and are resistant to adverse environmental conditions . Bacillus velezensis was originally described in 2005 , and various strains have since been researched for their potential as biopesticides [7, 8]. Here we isolated and characterized B. velezensis strain 9D-6 from a farm in Southern Ontario, Canada. This bacterial strain exhibits potent biocontrol activity against a wide range of bacterial and fungal pathogens. We identified antimicrobial compounds produced by B. velezensis 9D-6 as bacterial cyclic lipopeptides [Leu7] surfactin C14 and [Leu7] surfactin C15. 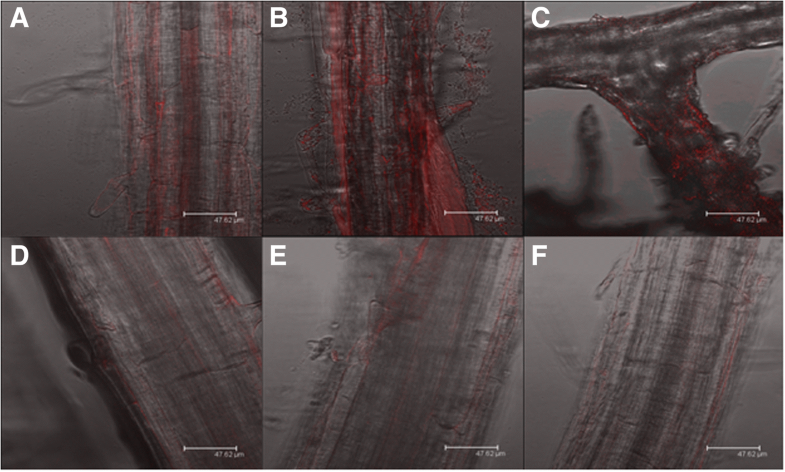 We further describe additional plant protection mechanisms of B. velezensis 9D-6 as it reduced root colonization by the plant pathogen Pseudomonas syringae DC3000. Moreover, we sequenced the genome of B. velezensis 9D-6 and the complete genome sequence presented here will facilitate future research and development of this and related organisms in agriculture and the biotechnology industry. Overall, the results indicate the potential of developing B. velezensis 9D-6 as a biopesticides for sustainable agriculture. Out of six hundred bacterial isolates from a remediated potato rhizosphere in Norfolk County, Ontario, Canada, isolate 9D-6 exhibited the highest degree of microbial growth inhibition. 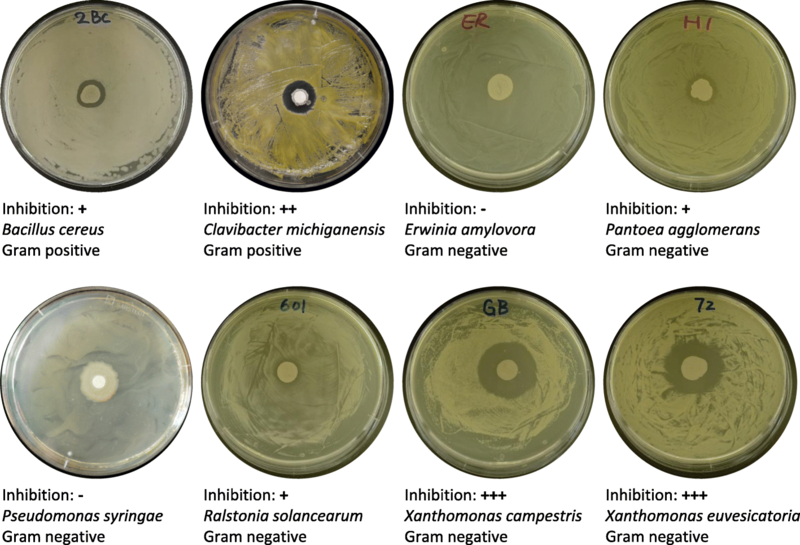 Zones of microbial inhibition on solid medium around discs inoculated with 9D-6 indicated that it inhibits growth of the Gram positive bacteria Bacillus cereus and Clavibacter michiganensis; and of the Gram negative bacteria Pantoea agglomerans, Ralstonia solanacearum, Xanthomonas campestris, and Xanthomonas euvesicatoria; but not Erwinia amylovora or Pseudomonas syringae DC3000. It inhibited growth of the ascomycete fungi Cochliobolus carbonum, Fusarium oxysporum, Fusarium solani, Gibberella pulicaris, Gibberella zeae, Monilinia fructicola, and Pyrenochaeta terrestris; the basidiomycete fungus Rhizoctonia solani; and the deuteromycete fungus Alternaria solani; but not the oomycete Pythium mamillatum. In summary, isolate 9D-6 inhibited growth of six of the seven bacterial pathogens and all nine of the fungal pathogens that were tested (Figs. 1 and 2). We further tested growth of strain 9D-6 at various temperatures and pH. Strain 9D-6 grew in liquid LB medium at a temperature range of at least between 12 °C and 50 °C, and at a pH between 5 and 8, with optimal growth around 30 °C and pH 7 (Additional files 1 and 2). BLASTn analysis of 16S rDNA amplified from isolate 9D-6 returned a > 99% identity match with the reference strain B. velezensis G341. Therefore, isolate 9D-6 is named B. velezensis 9D-6. To estimate the evolutionary position of B. velezensis 9D-6 relative to 27 other B. velezensis strains for which complete genomes are available, a phylogenetic tree was constructed based on the RNA polymerase β subunit (rpoB) gene. Compared with the 16S rRNA gene, rpoB provides better resolution between closely related organisms . The phylogenetic analysis suggests that B. velezensis 9D-6 is most closely related to B. velezensis AS43.3, and is also closely related to B. velezensis strains CC09, SB1216, TrigoCor1448, UCMB5033, and UCMB5036, followed together by UCMB5113 and the reference strain G341 (Fig. 3). In silico DNA-DNA hybridization (isDDH) was performed to confirm 9D-6 as a member of B. velezensis and to validate its position in the phylogenetic tree. Of the strains included in the tree (Fig. 3), the highest isDDH values with the genome of B. velezensis 9D-6 were obtained for strains TrigoCor1448 (92.5%), AS43.3 (92.0%), UCMB5113 (91.7%), G341 (91.7%), UCMB5033 (91.2%), SB1216 (91.1%), UCMB5036 (89.3%), and CC09 (89.1%). These eight strains form a cluster with B. velezensis 9D-6 in the rpoB phylogenetic tree. 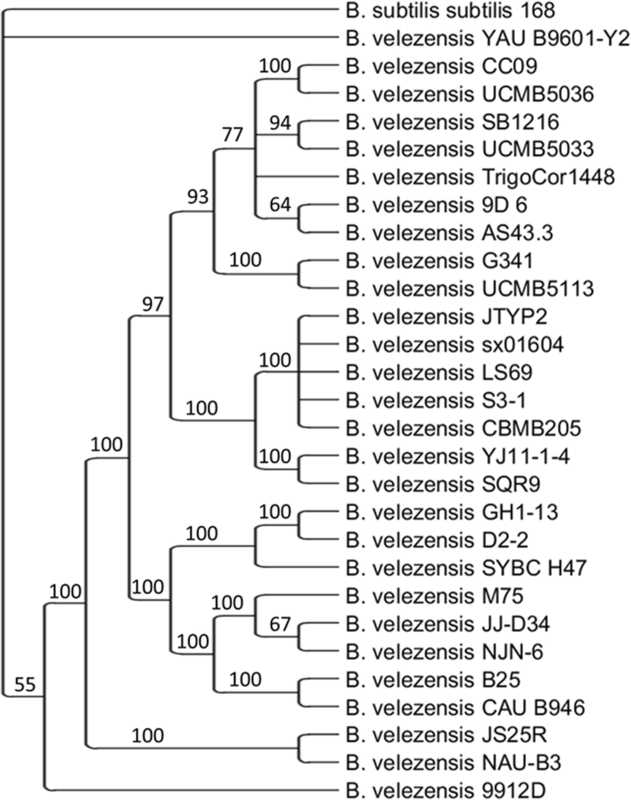 The values for isDDH between B. velezensis 9D-6 and that of the other B. velezensis strains range from 79 to 86%. In contrast, the value for isDDH is 21% between B. velezensis 9D-6 and B. subtilis subtilis 168. However, it ranges between 55 and 92% between B. velezensis 9D-6 and 22 B. amyloliquefaciens strains with complete genomes: 15 of these values are between 79 and 92%, while the remaining six (including the type strain DSM 7) are between 55 and 56%. To identify the antimicrobial compounds that contribute to biocontrol, B. velezensis 9D-6 metabolites were isolated into fractions using liquid chromatography, and each fraction was tested for antibacterial activity against the Gram-positive bacterium C. michiganensis, chosen due to its rapid growth rate and agricultural relevance [10, 11]. A fraction demonstrating activity (Fig. 4a) was then subjected to LC-MS to identify the active compound. The two major peaks observed had predicted chemical formulas of C52H91N7O13, and C53H93N7O13. Antibase identified the lipopeptide surfactins as possible identifications. 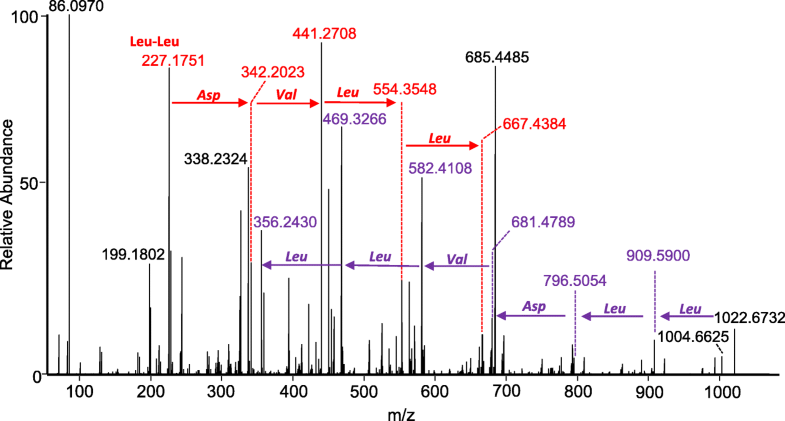 Comparison of the MS/MS of compound C52H91N7O13 with previously published MS/MS spectra  identified this peak as [Leu7] surfactin C14 (sometimes called surfactin B). MS/MS of the peak C53H93N7O13 allowed partial amino acid sequence to be determined by de novo sequencing (Fig. 5), suggesting it is [Leu7] surfactin C15 (sometimes called surfactin C). The surfactin fraction was then tested against the Gram-negative bacterium P. syringae DC3000 and the ascomycete fungus C. carbonum for verification (Fig. 4b-c). The antimicrobial disc inhibited C. carbonum when inoculated with surfactin concentrations between 1 mg/mL and 10 mg/mL. However, for P. syringae DC3000, the zones of inhibition were only apparent at the higher concentrations (5 mg/mL and 10 mg/mL) and were not very large, consistent with the inability of live B. velezensis to antagonize this bacterium (Fig. 1). To determine whether B. velezensis 9D-6 is able to inhibit microbial phytopathogenesis by mechanisms other than antimicrobial production, we tested its ability to reduce root colonization by P. syringae DC3000, a Gram-negative bacterium. Since growth of P. syringae DC3000 was not inhibited by B. velezensis 9D-6 in the in vitro plate assay (Fig. 1), reduced root colonization in response to B. velezensis 9D-6 should be due to a mechanism other than production of bacteriocidal or bacteriostatic antimicrobials. Co-inoculation of A. thaliana seedlings with B. velezensis 9D-6 and P. syringae DC3000 produced milder disease symptoms compared to inoculation with P. syringae DC3000 alone. By contrast, B. velezensis 9D-6 alone produced no visible symptoms of disease (Fig. 6). 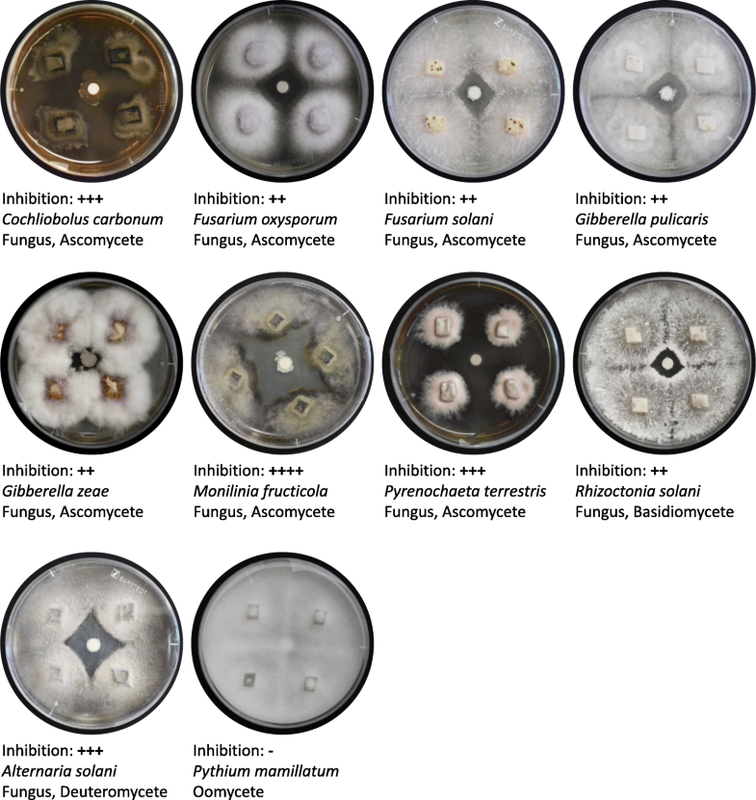 Co-inoculation of A. thaliana seedlings with B. velezensis 9D-6 and RFP-labeled P. syringae DC3000 also resulted in a notable decrease in root colonization by the pathogen at all tested concentrations, as indicated by an observable decrease in RFP fluorescence (Fig. 7). To allow further investigation into the biocontrol mechanisms of B. velezensis 9D-6 and its application for sustainable agriculture, we determined its complete genome. 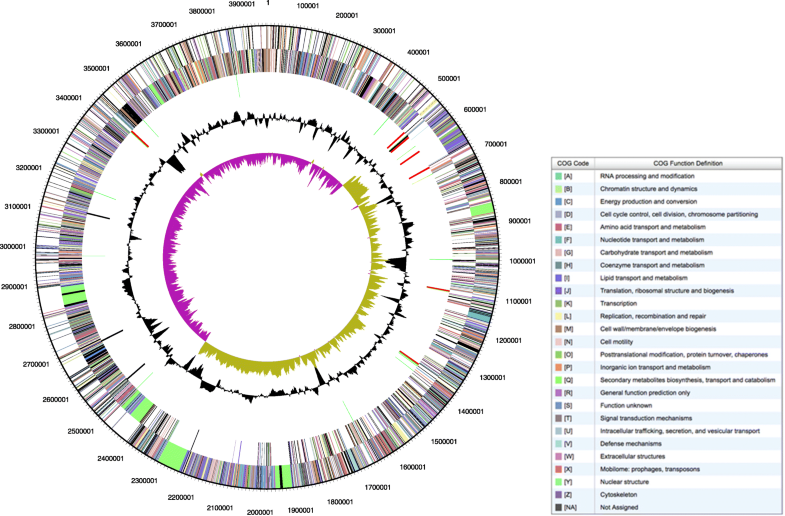 The B. velezensis 9D-6 genome consists of a single 3.96 Mb circular chromosome (Fig. 8), which fits within the range of 3.81 to 4.24 Mb reported for other completed genomes of the species. Like nearly 80% of those strains, it does not harbor a plasmid. The B. velezensis 9D-6 genome is predicted to include 3942 total genes, of which 3849 (97.6%) are protein coding genes, 93 (2.4%) are RNA coding, and 82 (2.1%) are pseudogenes (Additional file 3). Of the RNA coding genes, 21 are predicted to code rRNA and 68 are predicted to encode tRNA. Among the predicted genes, 2736 (69.4%) are associated with general COG function categories. The distribution of genes in these categories is presented in Additional file 4. The B. velezensis 9D-6 genome is predicted to contain thirteen gene clusters involved in antimicrobial production (Table 1), most of which are conserved in all B. velezensis strains (bacilysin, surfactin, macrolactin, fengycin, bacillaene, difficidin, bacillibactin [7, 13], butirosin, and a terpene ). AntiSMASH analysis of the B. velezensis 9D-6 genomic surfactin cluster predicted a lipopeptide sequence of ELLVDLL, consistent with the peptide ring of surfactin determined by the LC-MS/MS and de novo peptide sequencing. In contrast, the clusters predicted to produce ladderane and lantipeptide have not typically been found in this species. The lantipeptide cluster contains a predicted set of ten core biosynthetic genes, including the crucial modification enzyme LanM, but does not contain obvious hits for some other components including LanA and LanT. The ladderane cluster contains four core biosynthetic genes, encoding an acyl carrier protein, beta-ketoacyl synthase, 3-oxoacyl-ACP synthase, and 3-oxoacyl-ACP reductase. To determine the prevalence of the lantipeptide and ladderane clusters among strains of B. velezensis, we search the 27 other strains that are represented in our phylogenetic tree, all of which have completed genomes. Clusters for lantipeptides were found in 13 of the 27 other strains, while clusters for ladderane were found in only 2 of the 27 other strains. One strain other than 9D-6 harbors clusters for both lantipeptide and ladderane (strain UCMB5113). Of interest, other uncommon clusters among the strains are for thiopeptide (in 4 strains: D2–2, M75, JJ-D34, and B25) and phosphonate (in 3 strains: YAU B9601-Y2, JS25R, and NAU-B3) (Table 2). Consistent with previous findings, little correlation was observed between the presence of any specific cluster and its phylogenetic position within the species. B. velezensis SRCM101413, the strain with the largest number of coding sequences, contains a cluster for ladderane, but not for lantipeptide, thiopeptide, nor phosphonate. Manual mining of B. velezensis 9D-6 also identified a gene for butanediol dehydrogenase and genes predicted to encode components of secretion systems including the inner-membrane spanning twin-arginine translocation (Tat) system, SecYEG translocon, and the Type VII/ESX secretion system. The isolate 9D-6 was named B. velezensis 9D-6 based on a > 99% 16S rDNA identity match with the reference strain B. velezensis G341. In silico DNA-DNA hybridization (isDDH) also confirmed 9D-6 as a member of B. velezensis, with the isDDH value between B. velezensis 9D-6 and other B. velezensis strains ranging from 79 to 92%. This is above the typical standard of 70% for delineating species. Comparing B. velezensis 9D-6 to members of the related B. amyloliquefaciens gave isDDH values between 55 and 92%, with no values between 57 and 78%, in support of previous findings that many strains currently classified as B. amyloliquefaciens are actually B. velezensis . A key distinguishing feature among strains of B. velezensis is the complement of secondary metabolite clusters that are predicted contributors to antimicrobial activities . While many such clusters are common to multiple species of Bacillus, others are specific to certain strains of B. velezensis, with little correlation to the predicted phylogenetic relationships among these strains [7, 13]. Such ancillary clusters may function primarily to control other Bacillus species and Gram-positive bacteria . The B. velezensis 9D-6 genome is predicted to contain thirteen antimicrobial gene clusters. While the majority of the thirteen are conserved in all B. velezensis strains, the clusters predicted to produce ladderane and lantipeptide have not typically been found in this species. The cluster for ladderane has previously been found in Bacillus strains isolated from marine sponges , while various Bacillus strains produce lantipeptides . Lantipeptides are ribosomally synthesized peptides that are extensively post-translationally modified, and often disrupt the integrity of Gram-positive bacterial cell walls. For a class II lantipeptide, which was predicted for B. velezensis 9D-6, the ribosomally produced precursor peptide, LanA, is processed by two conserved enzymes, LanM and LanT. LanM acts via an N-terminal dehydratase domain and a C-terminal cyclase domain, whereas LanT performs cleavage of the leader peptide. Additional post-translational modifications can be performed by other enzymes, leading to further structural diversity among lantipeptides . While the B. velezensis 9D-6 cluster contains a gene for LanM, obvious matches for LanA and LanT appear to be absent, raising the possibility of a pseudogene cluster or misidentification. Ladderanes are a type of lipid known to be present in membranes that surround anammoxosomes, which are involved in anaerobic ammonium oxidation by bacteria in the phylum Planctomyces. While gene clusters for ladderane biosynthesis have been identified, the precise biosynthetic pathway is still unknown  leaving a greater possibility for misidentification of this cluster. In fact, a large overlap has been found between gene clusters for ladderane synthesis and those for synthesis of aryl polyenes , which offer protection from reactive oxygen species . Aryl polyene gene clusters have been found mainly in Gram-negative bacteria, many of which are either commensals or pathogens of eukaryotes. Their phylogenetic distribution has been described as markedly discontinuous, with clusters present in some strains but not others of most genera . This last point is consistent with our finding of the ladderane gene cluster in B. velezensis 9D-6 but not in most of the other B. velezensis strains. The genome of B. velezensis 9D-6 also encodes a putative butanediol dehydrogenase, which is a critical enzyme in the production of butanediol, known to induced systemic resistance (ISR) in plants . The presence of this gene therefore suggests that B. velezensis 9D-6 may contribute to plant defenses via ISR, whereby plants are primed for faster and stronger defenses against pathogens. Additionally present are genes predicted to encode components of secretion systems, which may help mediate relationships between B. velezensis 9D-6 and other organisms, including plants and pathogenic microbes. Among these are components of the inner-membrane spanning twin-arginine translocation (Tat) system and SecYEG translocon, and the Type VII/ESX secretion system, whose function remains unknown. The twin-arginine translocation (Tat) system transports fully folded proteins to the cell envelope or extracellular space , while the SecYEG translocon participates in the insertion of membrane proteins . B. velezensis 9D-6 inhibited in vitro growth of six of the seven bacterial pathogens and all nine of the fungal pathogens that were tested. This activity was shown to be due in part to the active compounds [Leu7] surfactin C14 (sometimes called surfactin B) and [Leu7] surfactin C15 (sometimes called surfactin C). These surfactins were shown to be inhibitory to the bacterial phytopathogen C. michiganensis and the ascomycete fungus C. carbonum, but not to P. syringae DC3000, consistent with the inability of live B. velezensis to antagonize this latter bacterium. Since not all test organisms used for the live B. velezensis disc assays were tested with surfactin, this antimicrobial fraction does not necessarily contribute to the activity against all of these organisms. Surfactins are cyclic lipopeptides, each comprised of seven amino acids and a hydrophobic fatty acid chain that is at least thirteen carbons long. They are synthesized independently of messenger RNA by nonribosomal peptide synthetases (NRPSs), which are multienzyme complexes that can incorporate a mixture of D- and L-amino acids. While structures have been identified that vary in amino acid identity at the 7th position, those that retain the ELLVDLL sequence have variously been called [Leu]- or [Leu7] surfactin [24, 25], surfactin A (where isoforms with V and I at position 7 are called surfactin B and C, respectively [26, 27], or simply surfactin; while the nature of the acyl chain is designated as C13, C14, C15, etc. (sometimes called surfactin A, B, C, etc. , which can be a source of confusion since the same nomenclature is used for the isoforms with respect to amino acid identity at position 7). Surfactins are known to have antimicrobial properties that act against both bacteria and fungi . They can insert into bacterial cell membranes, solubilizing the fluid phospholipid bilayer and creating pores and ion channels [29, 30]. Surfactins have also been shown to interfere with protein processing and secretion. For example, they disrupt aerial development of Streptomyces by interfering with the peptide SapB . For antifungal activity, surfactins can inhibit glucan synthase, which is involved in cell wall synthesis, and can induce apoptotic markers . In addition, surfactins are thought to play a key role in triggering ISR . They may also contribute to swarming motility [33, 34], which can help achieve effective rhizosphere colonization and facilitate plant growth promoting traits while simultaneously inhibiting competing microorganisms via antimicrobial activity . Despite the inability of either live B. velezensis 9D-6 or its surfactins to inhibit growth of P. syringae DC3000 in plate assays, B. velezensis 9D-6 proved effective against this phytopathogen in a plant system. It reduced both observable symptoms of P. syringae DC3000 in plants, as well as P. syringae DC3000 colonization of plant roots. These results indicate that B. velezensis 9D-6 produces a biocontrol effect attributable to something other than bacteriostatic or bactericidal compounds. Such biocontrol mechanisms could include adverse effects of sub-inhibitory concentrations of antimicrobials, which may possibly include surfactins. For example, secondary metabolites or enzymes can derail normal signaling pathways in other bacteria, including those leading to biofilm formation , which may be important to P. syringae DC3000’s survival or adhesion on plant roots but not on solid laboratory medium. Alternatively, B. velezensis 9D-6 may otherwise outcompete P. syringae DC3000 for resources that are more limiting in the plant system compared to the nutrient plate, or more limiting specifically within a biofilm, such as nutrients, oxygen, or space. This could include contact-mediated competition, where a membrane protein or secretion system delivers toxins to non-sibling cells in close proximity . Alternatively, B. velezensis 9D-6 may promote ISR against P. syringae DC3000, a mechanism which may also involve surfactin  or butanediol, production of which by B. velezensis 9D-6 is inferred from the genome. Here, we showed that B. velezensis 9D-6 exhibits, overall, a high degree of inhibition against phylogenetically diverse microbial pathogens. Its genome contains a unique complement of 13 gene clusters that are expected to participate in antimicrobial production, with [Leu7] surfactins C14 and C15 confirmed as contributing at least to antibacterial activity in vitro. In addition, we found B. velezensis 9D-6 is able to reduce root colonization by P. syringae DC3000, whose in vitro growth was not inhibited, demonstrating that B. velezensis 9D-6 can use additional mechanisms to control phytopathogens. B. velezensis 9D-6 is therefore a candidate biopesticide. The data presented here not only highlight the potential of B. velezensis 9D-6 as a biocontrol agent against phytopathogens, but also warrant further research and understanding of B. velezensis 9D-6, and may therefore contribute to future utilization of this strain. Soil samples were collected from Blizman potato fields in Norfolk County, Ontario, Canada in the summer of 2012. Over the previous three years, bio-organic fertilizer was added to the soil each spring in an effort toward natural remediation. In 2012 (the fourth year), 10.0 g of moist soil was collected, placed in 95 mL of sterile water, and shaken for 10 min. Then, 1.0 mL of this suspension was transferred for serial dilution up to 10− 10, and the dilutions were plated on tryptic soy agar (TSA) for 48 h at 28 °C to attain single colonies. Permission for this research was obtained from the Canadian Food Inspection Agency (CFIA). Six-hundred bacterial strains were further screened for their ability to suppress phytopathogens under in vitro conditions. Antimicrobial discs were prepared by inoculating 0.5 mm discs of P8 Filter Paper (Thermo Fisher Scientific, Pittsburgh, PA, USA) with 50 μL of 109 CFU/mL B. velezensis 9D-6 suspended in 0.85% NdaCl. To test inhibition of pathogenic bacteria, 100 μL of each bacterial test strain at 109 CFU/mL in 0.85% NaCl were spread onto separate LB agar plates, and an antimicrobial disc containing B. velezensis 9D-6 was placed in the centre of the plate. After two days incubation at 28 °C, zones of inhibition around the discs were recorded. Bacterial test strains were Bacillus cereus, Clavibacter michiganensis, Erwinia amylovora, Pantoea agglomerans, Pseudomonas syringae DC3000, Ralstonia solanacearum, Xanthomonas campestris, and Xanthomonas euvesicatoria. To test inhibition of pathogenic eukaryotes, four plugs from each tested strain were evenly spaced at the peripheries of a potato dextrose agar plate, and an antimicrobial disc containing B. velezensis 9D-6 was placed in the centre of the plate. After one to two weeks of incubation (depending on the growth rate of the test strain) at room temperature, zones of inhibition around the discs were recorded. Eukaryotic test strains were Alternaria solani, Cochliobolus carbonum, Fusarium oxysporum, Fusarium solani, Gibberella pulicaris, Gibberella zeae, Monilinia fructicola, Pyrenochaeta terrestris, Pythium mamillatum, and Rhizoctonia solani. Bacterial genomic DNA was used for PCR amplification of 16S rRNA. For genomic DNA isolation, a single bacterial colony was inoculated into 2.5 ml of LB broth and grown for 16 h at 30 °C with shaking at 200 rpm. Cells were collected by centrifugation of 1.5 ml culture at 13,000 rpm for 5 min and bacterial genomic DNA was isolated using GenElute Bacterial Genomic DNA Isolation kit (Sigma-Aldrich Co., St. Louis, MO, USA) in accordance with the manufacturer’s protocol. PCR amplification of an approximately 1,500 base pair sequence of the bacterial 16S rDNA gene was performed with primers 8F (5′- AGAGTTTGATCCTGGCTCAG-3′) and 1492R (5’-GGTTACCTTGTTACGACTT-3′) . Each 50 μL PCR mixture contained 1.5 units Phusion High-Fidelity DNA Polymerase (Thermo Fisher Scientific Inc., Waltham, MA, USA), 1X PCR buffer, 2.0 mM MgCl2, 200 μM dNTPs, 2.5 μM of each primer, 50 ng of genomic DNA template, and ultrapure water (Sigma-Aldrich Co.). The cycle parameters were as follows: initial denaturation at 95 °C for 5 min, followed by 30 cycles of denaturation at 94 °C for 30 s, annealing at 57 °C for 45 s, and extension at 72 °C for 60 s, with the final overall extension at 72 °C for 10 min. The 16S PCR products were purified by using QIAquick PCR Purification kit (Qiagen, Hilden, Germany) and sequenced with 8F and 1492R primers on a 3730 DNA Analyzer (Thermo Fisher Scientific Inc.) at Agriculture and Agri-Food Canada (London, Ontario, Canada). The 16S rRNA gene fragment was compared with the NCBI nucleotide database using Blastn to determine the closest taxonomic relatives. A phylogenetic tree was constructed based on RNA polymerase β subunit (rpo) gene sequences  obtained from the genome sequence (see below) to estimate the evolutionary position of B. velezensis 9D-6 relative to other B. velezensis strains. The Rpo protein sequence of Bacillus subtilis subspecies subtilis strain 168 (GenBank Accession NP_387988) was used as a query for translated BLAST (tblastn) against B. velezensis gene sequences in the NCBI database. In total, 28 B. velezensis rpo sequences were copied and aligned with rpo from B. subtilis subtilis 168 using WebPRANK software . The type strains of B. velezensis are NRRL B-41580 and KCTC 13012 , but neither of their genome sequences are complete, and they were therefore excluded from the analysis. Phylogenetic trees were constructed using MrBayes v.3.2  with the generalised time reversible (GTR) substitution model and default parameters for run length and frequencies. The B. subtilis subtilis 168 rpo was designated as an outgroup. Following analysis, the standard deviation of spilt frequencies was 0.006566 and the potential scale reduction factor (PSRF) was 1.000 or 1.001 for all factors. The majority-rule consensus tree was visualized using TreeGraph2 . To identify potential antimicrobial compounds produced by B. velezensis 9D-6, metabolites were isolated from a liquid LB culture grown at 28 °C for 72 h by ethyl acetate, liquid/liquid extraction. The extract was dried and resuspended in acetonitrile. After verifying the antibacterial and antifungal activity of the crude solution, compounds were separated into 22 fractions using a C18 reverse-phase high performance liquid chromatographer on a 1260 Infinity Series (Agilent Technologies, Santa Clara, CA, USA) eluted using an acetonitrile-water gradient with 0.1% formic acid. Fractions were each tested in duplicate for their antibacterial activity against C. michiganensis. Each antimicrobial disc was prepared by adding 50 μL of a fraction to a 0.5 mm disc of P8 Filter Paper (Thermo Fisher Scientific, Pittsburgh, PA, USA), which was then placed onto an LB agar plate spread with 100 μL of 109 CFU/mL C. michiganensis in 0.85% NaCl. Controls used acetonitrile in place of the metabolite fraction. Fractions demonstrating antibacterial effects were individually analyzed using ultraviolet-visible (UV-vis) spectroscopy at 210 nm and 254 nm to identify UV-active compounds. These compounds were isolated and tested in a final in vitro antibacterial plate assay against C. michiganensis. The compounds of bioactive fractions were characterized by high resolution LC-MS/MS using a Q-Exactive Quadrupole-Orbitrap Mass Spectrometry (Thermo Fisher Scientific, Waltham, MA, USA). Full MS and MS/MS spectra were analyzed manually with XCalibur software (Thermo Fisher Scientific, Waltham, MA, USA). The full MS data was used to identify possible molecular formula (< 3 ppm). Formulas were than searched against the AntiBase 2012 Natural Compound Identifier database  to identify purified compounds. When possible, the MS/MS spectra were used for de novo sequencing of peptide containing compounds to confirm possible Antibase identified compounds. The surfactin fraction was then tested for activity against P. syringae DC3000 and C. carbonum. Discs were inoculated with 50 μL of the fraction at concentrations of 10 mg/mL, 5 mg/mL, 2.5 mg/mL, and 1 mg/mL. Discs were then placed onto LB agar plates that were either spread with P. syringae DC3000 or contained a central agar plug of C. carbonum. To determine whether alternative control mechanisms (such as induced systemic resistance) might be elicited by B. velezensis 9D-6, we tested its ability to reduce root colonization by P. syringae DC3000, a Gram-negative bacterium whose growth in vitro was not inhibited by B. velezensis 9D-6. P. syringae DC3000 was labeled using a red fluorescent protein (RFP) reporter gene construct based on the plasmid pME6010 [41, 42], and used to inoculate Arabidopsis thaliana (L.) Heynh seedlings in hydroponic medium (2.5 × 105 CFU/mL), with or without B. velezensis 9D-6 (2.5 × 106 CFU/mL), as previously described . The A. thaliana (L.) Heynh seeds were obtained from the Arabidopsis Biological Resource Center (Columbus, OH, U.S.A) and grown as previously described . After seven days, A. thaliana roots were removed from the medium, rinsed in ultrapure water to remove loosely bound material, and attachment by labeled P. syringae DC3000 was imaged using a DMIRE2 inverted microscope with confocal laser scanner (Leica Microsystems GmbH, Wetzlar, Germany). Samples were excited using a helium-neon 543/594 nm laser, and emission was detected at 590–630 nm under a 63 x water immersion objective with a numerical aperture of 1.4. Following isolation from potato field soil of Norfolk County, Ontario, Canada, a single colony of B. velezensis 9D-6 was grown for 48 h in 3 mL of lysogeny broth (LB) at 28 °C and 60 rpm in a TC-7 drum rotor (New Brunswick Scientific Co., Enfield, CT, USA). Genomic DNA was isolated from 1.5 mL of the culture using the GenElute Bacterial Genomic DNA kit (Sigma-Aldrich Co., St. Louis, MO, USA) according to the manufacturer’s protocol for Gram positive bacteria, with the exception that DNA was eluted in UltraPure DNase/RNase-free distilled water (Thermo Fisher Scientific Corp., Waltham, MA, USA). DNA quality was assessed by agarose gel electrophoresis. Genomic DNA was sequenced at AGCT Inc. (Wheeling, IL, USA) using the MiSeq next generation sequencing platform (Illumina Inc., San Diego, CA, USA). Libraries were constructed using the NexteraXT DNA sample preparation kit (Illumina Inc., San Diego, CA, USA) with a target average insert size of 500–600 bp. Sequencing generated 5,453,964 raw read pairs of 2 × 150 bp read length on average. Adaptor sequences, low quality sequences, and short reads were filtered out using BaseSpace (Illumina Inc., San Diego, CA, USA), Trim Galore (Babraham Bioinformatics, Babraham, UK), and Sickle . The remaining 4,722,973 trimmed read pairs were assembled de novo and scaffolded with SPAdes v. 3.50  into 47 contigs with an N50 of 507 kb spanning 100x coverage. The draft genome was aligned with test reference genomes, including that of B. velezensis G341 (GenBank Accession CP011686), using the Mauve Multiple Genome Alignment tool  version 2.4.0 to generate a preliminary chromosome map. Primers were designed based on the contig orientations suggested by the chromosomal map, and connections were confirmed by Sanger sequencing of PCR products followed by alignment with the draft genome using SeqMan Pro (DNASTAR Inc., Madison, WI, USA) . All gaps were closed with one of two repeat sequences; one containing a transposon region and one containing an rDNA operon sequence. After closure and validation of gaps between draft contigs, the final completed genome was assembled into a single 3.96 Mb chromosome using the largest 20 contigs. The remaining 27 contigs were identified as redundant fragments. Numbers of genes (rRNA genes, protein coding genes, pseudogenes) were predicted on the DOE-JGI Microbial Genome Annotation Pipeline (MGAP v.4) . In silico DNA-DNA hybridization (isDDH) was performed via the GGDC web server (http://ggdc.gbdp.org) using formula 2 . Secondary metabolite clusters were identified using both MGAP v.4 and antiSMASH3.0 . The genome was also mined in silico using target amino acid sequences from closely related species from the UniProtKB sequence database  and comparing them to translated draft genome nucleotide data using tBLASTn. We thank Alexander W. Eastman, Filip Zekic, Niki Bennett (OGVG) and Dr. Erin Azzopardi (Mitacs) for useful discussions. This work was supported by Agriculture and Agri-Food Canada Growing Forward-II [project J-001332 and project J-001589]; Natural Sciences and Engineering Research Council of Canada (NSERC) [Discovery grant RGPIN-2015-06052]; Ontario Greenhouse Vegetable Growers (OGVG) and Mitacs-Accelerate [Fund IT07941-Yuan_OGVG]. The funders had no role in the design of the study or the collection, analysis, and interpretation of data. The datasets generated and analysed during the current study are available in the GenBank repository, https://www.ncbi.nlm.nih.gov/nuccore/CP020805, or included in this published article and its supplementary information files. ENG contributed to genome sequencing, and completed the genome. ENG and BW performed in vivo experiments. JM and ENG drafted the manuscript. JM and MH contributed to the analysis and interpretation of data. TM and JR performed chemical extractions and surfactin identification. OS contributed to genome sequencing. ZCY conceived of the study, designed the experiments, and critically revised the manuscript. All authors read and approved the final manuscript. Joshi NA, Fass JN. Sickle: A sliding-window, adaptive, quality-based trimming tool for FastQ files. GitHub. 2011. https://github.com/najoshi/sickle. Accessed 1 June 2017.